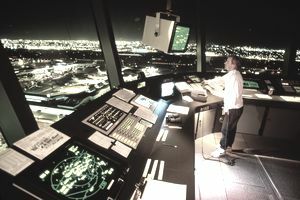 Air traffic controllers coordinate the movement of air traffic. They work in control towers, control facilities, and route centers, ensuring safe and orderly air traffic. Being an air traffic controller is a unique occupation that can be both rewarding and stressful. You are responsible for airplanes both landing at your airport and traveling through your airspace. Your potential employer will be looking for a candidate who can show their knowledge in the field as well as their ability to keep their composure and focus, even when under stress. Read below for information on the types of interview questions you might be asked during an interview for an air traffic controller position. Below is also information on how to prepare for the interview and a list of specific interview questions. Some questions you will be asked during your interview will be common interview questions you might be asked at any job, including questions about your work history, your strengths and weaknesses, and your skills. Other questions will be personal questions about your qualities as they relate to the job. For example, you might be asked how you handle pressure, why you want to be an air traffic controller and more. You will also likely be asked a number of behavioral interview questions. These are questions about how you’ve handled certain work situations in the past. For example, you might be asked how you have dealt with a stressful situation at work. The idea behind these questions is that how you behaved in the past gives the interviewer insight into how you might behave on the job. Other questions will probably be situational interview questions. These are similar to behavioral interview questions, as they are questions about work experiences. However, situational interview questions are about how you would handle future situations rather than past situations. For example, an interviewer might ask how you would handle an air traffic emergency. One important way to prepare for interviews is to think about examples of times you demonstrated the skills necessary for the job. Look back at the job listing, and highlight any key skills and abilities. Then, think of specific examples of times you demonstrated each of these. It will make it easier to think of these examples during the interview. You can use when you are answering behavioral and situational questions. For example, one skill required for every air traffic controller position is the ability to handle stress. During the interview, be prepared to share examples of demanding situations you have been in, and explain how you handled them. When answering a question using a specific example, use the STAR interview technique. Describe the situation you were in, explain the task you had to accomplish, and detail the action you took to accomplish that task (or solve that problem). Then, describe the results of your actions. You can also demonstrate your ability to handle stress through your behavior during the interview. A job interview is an ideal time to see how someone handles stress. Do your best to demonstrate your ability to stay calm and not freeze up during the interview. The more you prepare for the interview, the calmer you will be. Another way to prepare is to practice answering interview questions you will likely be asked. Read through the list of common air traffic controller interview questions below, and practice answering each. It will help you answer with more confidence during the actual interview. Do you enjoy shift work? How do you create a work-life balance with shift work? Are there certain hours of the day during which you would prefer not to work? How do you deal with stress in your daily life? Are you able to stay focused on a task for a long period of time? Do you consider yourself a punctual person? What kind of supervisor do you prefer to work with? Do you prefer to work alone or with colleagues? Why? What is the most rewarding part of being an air traffic controller? Why? Why do you want to be an air traffic controller? Tell me about the most stressful situation you have had at work. What did you do in the situation? Is there anything you would have done differently? Tell me about a time you used foresight to solve a potential problem. Describe a time in the tower when you saw a potential conflict or issue. How did you help to prevent the issue from becoming an actual problem? Have you had to deal with an emergency situation in the tower before? How did you handle the situation? Describe a time when you had a conflict with a coworker. How did you handle the conflict? Describe a time you worked with your coworkers to solve a problem. Imagine you are helping a pilot land, but the people next to you in the room are dealing with a separate emergency. How would you handle this distracting environment? How would you handle a stressful, even tragic day? How would you prevent this from negatively impacting your life? If you were to witness a major injury or accident in your daily life, what would be your first action?